The term “smart grid” refers to the use of technologies and tools that help electric utilities better meet consumers’ needs reliably and affordably by more effectively monitoring power usage demand and system conditions on a near real-time basis. The smart grid combines digital devices, software applications and two-way communications that allow utilities to track the flow of electricity with great precision, pinpoint outages, identify voltages out of allowed ranges, and transmit messages to transformers, capacitors, circuit breakers and other distribution equipment to initiate diagnostic or corrective (self-healing) actions. It can also let utilities record consumer electric use in various time intervals and provide consumers with hourly energy usage data. The U.S. Department of Energy lists seven functions of a smart grid: enabling informed participation by consumers; accommodating all generation and energy storage options; creating new products, services and markets; delivering power quality for the range of needs in the 21st century; optimizing asset utilization and operating efficiency; addressing disturbances—automated outage prevention, containment and restoration; and operating resiliently against physical and cyber-attacks and natural disasters. Across the nation, utilities are modernizing electric distribution systems by deploying advanced communications and automation technologies—including smart meters—to improve reliability, increase efficiency and help control electricity costs for consumers. What is Advanced Metering Infrastructure (AMI)? Advanced metering infrastructure (AMI) is a comprehensive set of technologies and software applications that combines two-way communications with smart meters to provide electric utilities—using frequent meter reads—with near real-time oversight of system operations. It allows them to remotely collect kilowatt-hour use (and in some cases, electric usage demand) information and transfer it to a central database for billing and/or analyzing purposes. Electric usage can be gathered and sent via drive-by or walk-by readings, as well as radio frequency (RF), power line carrier, telephone lines, cellular or other wireless systems. Coweta-Fayette EMC uses Aclara-TWACS (Two-Way Automatic Communication System) Advanced Metering Infrastructure and our power lines as the carrier. A smart meter is an advanced digital electric meter that records energy consumption in time intervals. It then uses two-way communications to transmit the information back to a local utility for power-quality monitoring and billing purposes. Are all smart meters alike? No. Smart meters can be read using different communication mediums. Communication mediums can be radio frequency (RF), power line carrier, telephone lines, cellular or other wireless systems. What type of smart meter solution does Coweta-Fayette EMC use? Coweta-Fayette EMC installed TWACS as our smart meter solution. It utilizes our existing distribution lines to communicate with the meter and transmit usage data. This is not a radio-based system, so no wireless RF signals are transmitted. Communication between the electric meter and Coweta-Fayette EMC is accomplished via the existing power lines using a method to send secure data. TWACS is not a broadband power line solution. TWACS modules are installed in solid-state electric meters and only communicate on a schedule determined by Coweta-Fayette EMC. Each communication with the cooperative takes less than 8 seconds. TWACS automates the meter-reading process; only electric meter data is securely collected, no user or account information is transmitted. Data collected via TWACS is the same data currently available today via manual meter reads. TWACS solutions have been in use since 1985 by more than 350 utilities throughout 42 states and various international locations. Over 12 million TWACS electric meters are installed and in use. What are the benefits of using TWACS? The system controls our meter-reading costs, while also improving our accuracy. It provides the member with useful consumption data to help them make informed energy management decisions, and it gives customer service information when helping a member with billing-related issues. TWACS allows for outage assessment and restoration monitoring, which helps to reduce any time without power. It improves the efficiency of the electric distribution system by giving data for system planning, and it provides an avenue to create additional optional rates. The system uses existing power lines for electric meter data communications and fully complies with all required industry and government standards. How do these meters differ from our previously existing meters? Previously existing meters were read once a month manually by a meter reader. 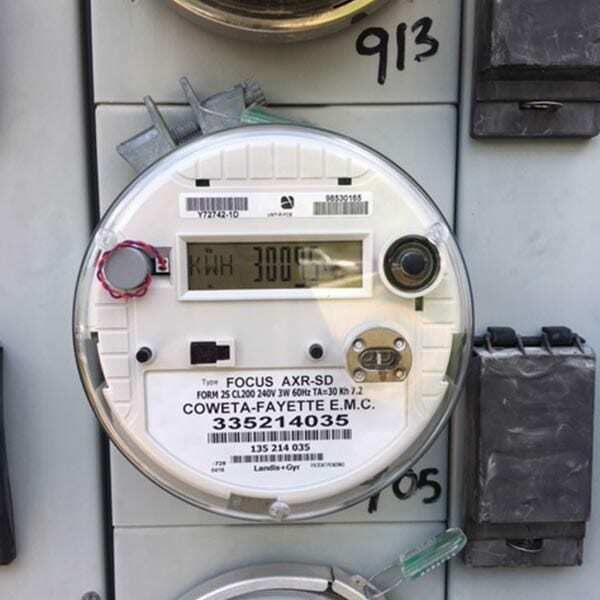 With smart meters, Coweta-Fayette EMC receives usage information more frequently using secure two-way communication over the existing power lines. How do I read a smart meter? How accurate are the meters? All electric meters (including TWACS) must be certified and conform to or exceed American National Standards Institute (ANSI) standards for meter accuracy and performance. 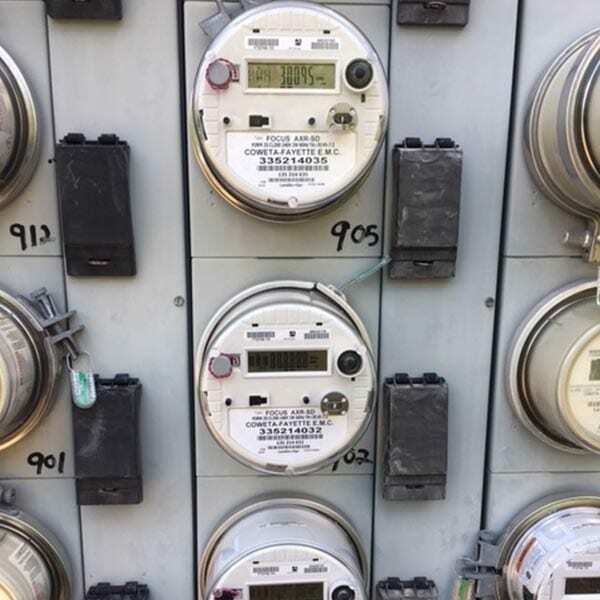 To ensure the meters are as accurate as possible, they are subjected to strict design standards when they are manufactured, and Coweta-Fayette EMC tests meters on a random basis both before and after putting them into service to confirm accurate operation. Do the smart meters used at Coweta-Fayette EMC produce harmful radio frequency (RF) emissions? No. 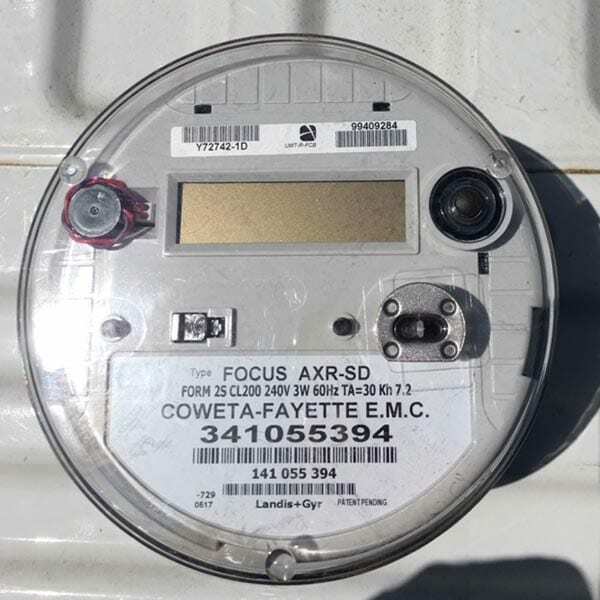 The smart meters used by Coweta-Fayette EMC do not produce any RF signals. The smart meters use a power line carrier technology to talk to and receive information from the cooperative. The information is sent from the meter to the substation over the existing distribution lines. It is then transmitted via a secure connection back to our office. The meter is simply a circuit board. There are no radioactive elements that emit radiation. The TWACS module has 500,000,000 times less emissions than the average microwave oven. Can the meter identify other electrical devices/appliances being used inside the home? No. It only collects the hourly energy usage data and cannot determine what type of electric device is in use inside a home or when it was operated. Does the meter monitor personal activities/occupancy inside a home? No. The meter only collects the hourly energy usage data. Coweta-Fayette EMC cannot use this data to determine what a member is doing inside a home. The data collected is no different than if we sent a meter reader out to read an old mechanical meter every hour. In fact, collecting the kWh data remotely is less costly and invasive than if we were to send a meter reader to your home. It’s just a device that measures electricity, not a surveillance device. Do smart meters transmit any personally identifiable information? What is Coweta-Fayette EMC’s assessment of their TWACS smart meter solution? Coweta-Fayette EMC has successfully deployed the TWACS solution at all of our member locations with great success. 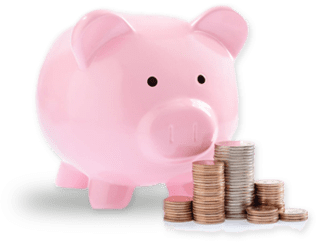 It is a safe, accurate and reliable system that allows us to manage our operational costs with many added benefits to our members.